Protesters under the banner of "Occupy Wall Street" continue their second week of protests in New York City. We're joined by protest organizer Lucas Vazquez to discuss the issues driving the protests. 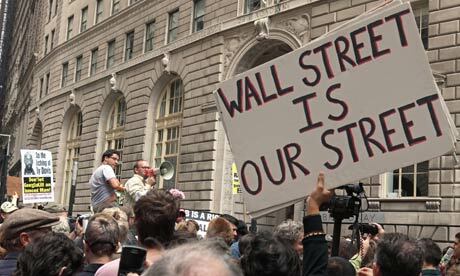 Protesters under the banner of “Occupy Wall Street” continue their second week of protests in New York City. We’re joined by protest organizer Lucas Vazquez to discuss the issues driving the protests. Then, we’re joined by two other political activists to talk about other upcoming actions and the issues they are confronting. Our guests are Margaret Flowers, organizer for the October 2011 movement, and Charles Lollar, Maryland State Director of Americans For Prosperity. Americans for Prosperity AFP is a koch brother financed right wing propaganda tool – Americans for Prosperity (AFP) is a group fronting special interests started by oil billionaire David Koch and Richard Fink (a member of the board of directors of Koch Industries). AFP has been accused of funding astroturf operations but also has been fueling the “Tea Party” efforts.